Center for Coastal Studies image taken under NOAA permit #18786. Tim Werner is tired of the “comfort zone” of whale entanglement rescue. It’s not enough to wait until whales become trapped to save them, the New England Aquarium official said. That’s why Werner and 40 other scientists, fishermen, and engineers convened at a workshop in Portsmouth, N.H., this week to discuss ways to prevent whales from getting entangled. The workshop began Monday and runs through Thursday. The attendees, who come from Europe, Australia, Brazil, Mexico, Korea, Greenland, South Africa, Canada, and the United States, want to figure out how commercial fishermen can continue to fish effectively while not trapping the 14 species of large whales around the world prone to entanglement. Ideas proposed at the workshop, including using weaker rope or (in some cases) no rope at all, show great promise for preventing future whale entanglement, Werner said. “We’re coming together as researchers, as fishermen, as government officials, as fishing gear engineer manufacturers, to work through this problem,” he said. One idea researchers have been exploring is rope with “weak links” throughout the length of the line. This lessens the breaking strength of the rope and makes it hard for whales to get permanently stuck, Werner said. 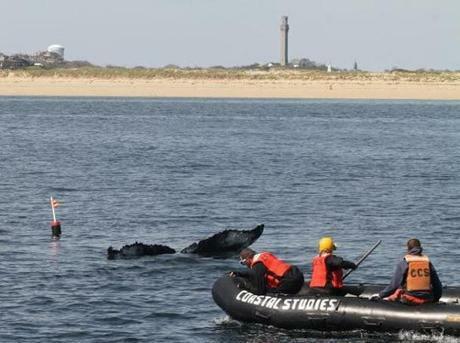 “If the whale becomes entangled, the hope is that they will be able to break free,” he said. The design was created by a fisherman, he said, and is still practical for fishing. An innovation from Australia is the idea of rope-less lobster cages that can be located using GPS, Werner said. And they can be released to the surface if trappers send a signal into the water, Werner said. New England Aquarium researchers are also looking into ways that the colors of ropes affect whether whales run into them. Initial studies show that red or orange ropes are a better visual deterrent for whales, but the aquarium is still in the “early stages of understanding whether that’s a promising technique,” Werner said. All of these ideas, however, are extremely difficult to test, he said. It’s hard to get a large enough sample size to make conclusive decisions, and scientists don’t want to purposefully put whales in danger in the name of innovation. J.D. Capelouto can be reached at jd.capelouto@globe.com.